WASHINGTON, D.C. (August 3, 2017) – (RealEstateRama) — The National Endowment for the Humanities (NEH) today announced $39.3 million in grants for 245 humanities projects across the country. The grants include funding to help revitalize the Lakota/Dakota language through a master-apprentice language-learning program for Sioux Tribe members and the creation of a veterans studies program at Missoula College in Montana. This round of funding, NEH’s third and last for fiscal year 2017, will support vital research, education, and public programs in the humanities. These peer-reviewed grants were awarded in addition to $46.1 million in annual operating support provided to the national network of state and local humanities councils during fiscal year 2017. This funding cycle includes grants for a number of notable publication projects that, through sustained NEH support, help illuminate the nation’s founding. NEH Scholarly Editions and Translations grants were awarded: for the George Washington Papers Project and the publication of volumes covering Washington’s second term, which ended with the rise of political parties; for the Adams Papers Editorial Project for an edition of John Adams’s papers from his final months as president; and for continuing work on the presidential papers of James Madison and James Monroe. A grant for the final volumes of The Documentary History of the Ratification of the Constitution, which makes available the content and context of state-by-state debates over the most important document in U.S. history, brings to completion a landmark work of historical and legal scholarship that has been supported by NEH since 1982. Grants awarded today also support partnerships among multiple organizations in a town, county, or region. Efforts funded in this area include: the development of a Birmingham Industrial Heritage Trail mobile guide to the city’s industrial history; a collaboration in Alaska to collect and preserve oral histories of fishermen, cannery workers, local residents, and Native groups associated with the Bristol Bay salmon fishery; and a series of public programs on the West Virginia Mine Wars to commemorate the centennial of the Battle of Blair Mountain. This round of funding also includes three cooperative agreements that reflect key NEH priorities: a partnership with First Nations Development Institute to revitalize Native American languages through creation of language-immersion programs; a collaboration with Blue Star Families to expand its “Books on Bases” literacy program for military families; and the renewal of NEH’s partnership with the Mid-America Arts Alliance for “NEH On the Road,” which brings smaller versions of major NEH-funded exhibitions to small and mid-sized museums around the nation. NEH grants will also support production of a documentary on four centuries of the Atlantic slave trade by award-winning filmmaker Stanley Nelson; the development of computational methods for identifying etchings made by Rembrandt; a statewide series of community reading and discussion events in Indiana focused on the 200th anniversary of Mary Shelley’s Frankenstein; and a traveling exhibition on whaling in 19th-century popular culture and literature organized around a restored 1,275-foot panoramic 1848 painting of a whaling voyage. 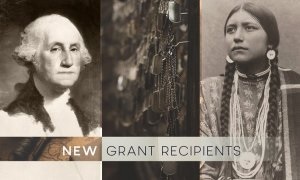 Several projects receiving grants today will help preserve fragile historical and cultural collections and make them more accessible to the broader public, such as grants to safeguard a collection of Native American and Medieval and Renaissance art at the Philbrook Museum of Art in Tulsa, Oklahoma; for the preservation of Civil War artifacts recovered from the USS Monitor warship in Newport News, Virginia; and new initiatives in Arkansas and Georgia to digitize historic local newspapers for inclusion in the Chronicling America database at the Library of Congress. Other grants will support the creation of a digital edition of Civil War–era records from Kentucky documenting the impact of the war on public and private life; analysis of 43 Native American sites in Arizona’s Gila River Valley; summer institutes for schoolteachers on Appalachian culture and history and on Roman daily life in ancient Pompeii; and the use of aerial thermal images to explore buried archaeological sites in the U.S., Mexico, Cyprus, and Iraq. NEH’s Public Scholar awards, which support popular books in the humanities, will support a history of modern Syria from the 19th century to the present, a new biography of American poet Sylvia Plath, and a book on the Blackwell sisters, 19th-century doctors who founded a women’s medical college. Media Projects: Development and Production Support film, television, and radio projects that explore significant events, figures, and ideas within the humanities. Development grants enable media producers to collaborate with scholars to develop humanities content and to prepare programs for production; production grants support the preparation of a project for presentation to the public.